We found L'Apicio almost accidentally while exploring the less-explored side of Aundh, near Medipoint Hospital. The place has a quintessential cafe-next-door feel clubbed with bright yellow doors, charming planters at the entrance, a glassy live kitchen beside the seating area, low-drop lights and a counter full of sweet treats, macaroons, pastries and more. Coming to the menu, L'Apicio amalgamates the authenticity of European, Continental, and Mediterranean cuisines. The most interesting dish that we tried here was the Bloody Mary spaghetti, which was made of classic pomodoro, tabasco, olives, and parsley pangrattato, all smothered in Worcestershire sauce, a sweet and savoury sauce created with anchovies, barley malt vinegar, tamarind, and molasses. 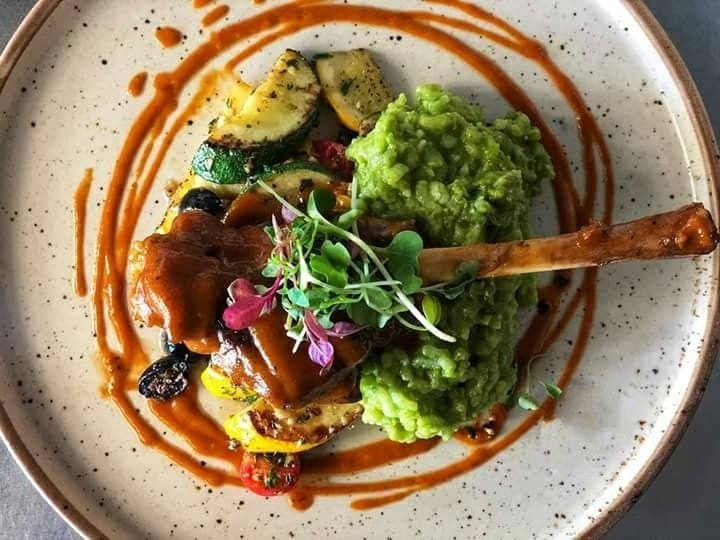 For mains though, don't look beyond the heavenly braised lamb shank served with minted pea risotto and sauteed courgette. Vegetarians, we recommend you try the seitan steak with a side of crispy potato fries and balsamic tomato sauce. What's more? L'Apicio is perhaps one of the best cafes in town for melt-in-the-mouth desserts. Our recommendation would be the Spanish torrijas, which are sweet and soggy pieces of bread with star anise poached pear, granola, cream cheese soft serve, and Dulce de leche drizzle.